Yahoo Buzz is a new upcoming service from Yahoo, according to Valleywag it will launch on February 26th. Yahoo is quickly launching so many products after the Microsoft bid. What is all about Yahoo Buzz ? Yahoo! Buzz features the most popular stories right now, determined by people around the Web. 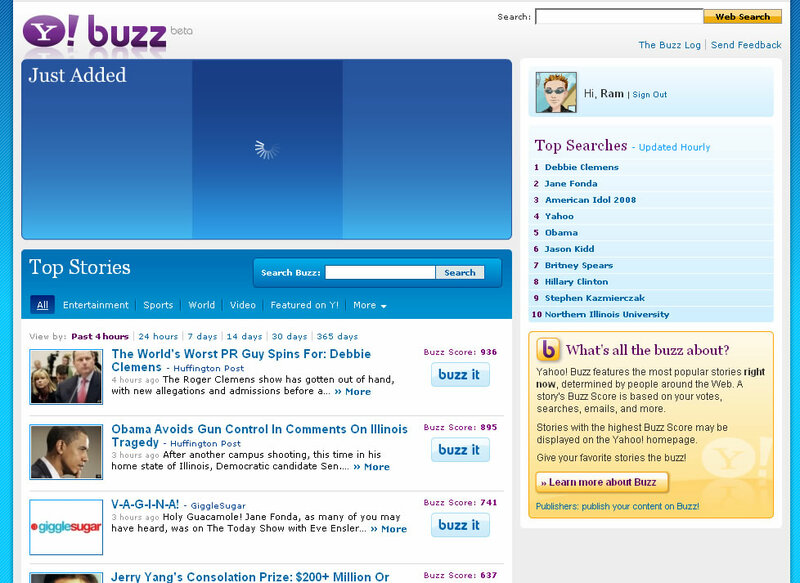 A story’s Buzz Score is based on your votes, searches, emails, and more. 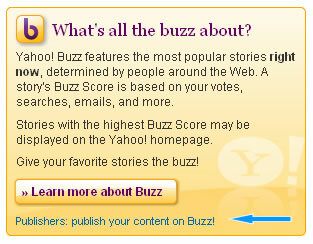 Stories with the highest Buzz Score may be displayed on the Yahoo! homepage. Give your favorite stories the buzz! 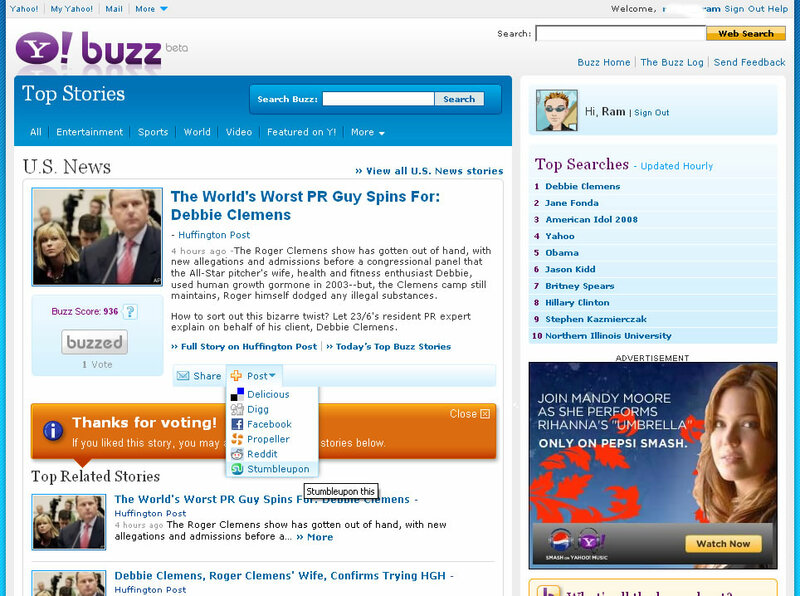 It looks like a Digg competitor (sort of), more like a news aggregator, users can vote on the stories to give it a buzz. There is no provision for submitting stories by users, but this may change later. Possibly publishers can submit their content to include in Yahoo buzz, there is a link on Yahoo Buzz page which reads “Publishers: publish your content on Buzz!”, when i click it is going to Yahoo employer login page. 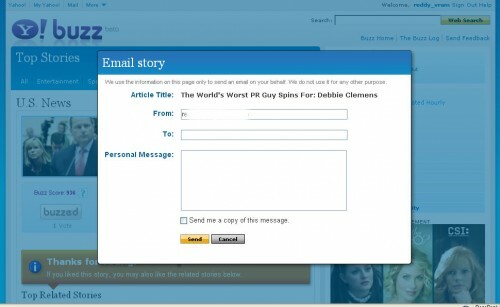 Yahoo may allow publishers to submit their “feeds” (URLs of the stories looks like they are updated from feeds). There is some buzz score on each article, buzz score relates to the position of the story on the page. When you click the Buzz button it will lead to that story page, with related stories below this story. Currently included (what i saw) sites in Yahoo buzz, PopSugar, Huffington Post, Yahoo News, GiggleSugar, Salon.com, USA Today. Top searches links lead to Yahoo search and Yahoo Buzz search. I will post more details as i explore the site. Yahoo Buzz is down, Live again. Very interesting! Keep us informed and thanks for posting. Looks like a great service from Yahoo. I’m eager to try it out.